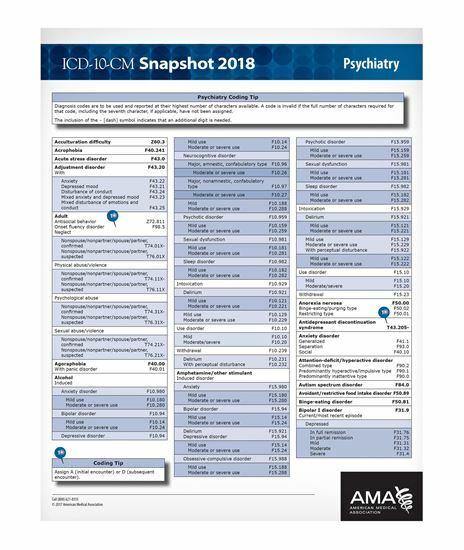 These revised and up-to-date coding cards offer a snapshot of the ICD-10 codebook, providing commonly reported diagnostic codes and the associated guidelines for major specialties. The cards detail the specificity required to improve documentation. Pushpin icons help Snapshot card users connect coding tips back to specific codes. These easy-to-use reference cards allow health care providers and staff members to quickly locate a desired code. This series contains 24 specialty-specific Snapshot cards updated to reflect the final 2018 code set. Diagnostic coding is a snap when using the ICD-10 Snapshot coding cards.